Photo Info/Credit: The Ann Arbor passenger station and Hotel Frontenac at Frankfort, Michigan in a postcard view. The hotel was built by the railroad in 1907 to promote tourism and use of their passenger trains. It was destroyed by fire on January 12, 1912. In the late 1800's and early 1900's, railroads built their own resorts for the purpose of improving passenger train revenue. At this time in our history, many citizens lived and worked in crowded cities in cramped conditions. The ability to run extra passenger trains to resorts which were outside of the city was very popular. Some resorts, such as Linwood Park on the Detroit & Mackinac north of Bay City was within an hour of Bay City and Saginaw. Other resorts, such as the Grand Hotel on Mackinac Island, was a 12-hour train ride from Detroit or Grand Rapids, and required a ferry boat ride across the Straits of Mackinac. Crestview Casino & Resort, Phoenix, in the Keweenaw peninsula. Owned by the Keweenaw Central Railroad in 1909, this resort was about 30 minutes north of Calumet. Electric Park, near Calumet. Operated by the Houghton County Traction Company, this park with a covered pavilion hosted bands, sports and dancing late into the night. Streetcars brought people in from Calumet to the north and Houghton and Handcock from the south. Frontenac Hotel, Frankfort (on Lake Michigan). This hotel was at the end of the Ann Arbor Railroad's main line at Lake Michigan. After a few years of operation, the hotel burned down and was not rebuilt. Grand Hotel, Mackinac Island. The Grand Hotel was built by a partnership of the Michigan Central, Grand Rapids & Indiana and the Cleveland Navigation Company. The island continues as one of Michigan's finest resort hotels today under private ownership. Linwood Park, Linwood. MI. Linwood Park was a day resort operated by the Detroit & Mackinac railway on Saginaw Bay. Miscauno Island, Menominee River. 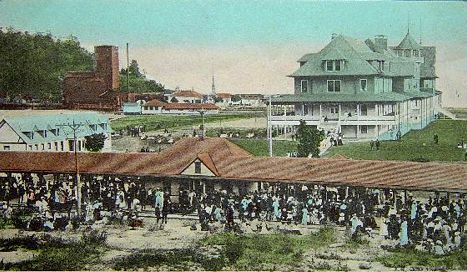 According to the book A Most Superior Land, the Wisconsin & Michigan Railway built this resort hotel on the island in the middle of the Menominee River for its railroad customers. The resort was described as "plush" and had telephones, marble baths, and electric lights, which were uncommon at the time. "A special train bore distinguished guests from Chicago for the grand opening, and other specials came from Iron Mountain and Marinette-Menominee to bring the total attendance to more than 500 visitors. Despite well-advertised sleeper service from Minneapolis and Chicago, the hotel couldn't attract enough business on a regular basis and soon shut down". Oa-At-Ka Beach, Bay County. Oa-At-Ka Beach was serviced by an extension of the Grand Trunk Western Saginaw to Bay City line. It was located on Saginaw Bay near North Bay City. Tawas Beach Resort, East Tawas, Michigan. Built and owned by the Detroit & Mackinac Railway, this was primarily a day excursion park near the Tawas Point Lighthouse. It was reached by a short branch line off the main line north of town. There were many resorts along railroad lines which were not officially owned or operated by the railroads. These included resorts at Lakeland, Manitou Beach and Harbor Springs.